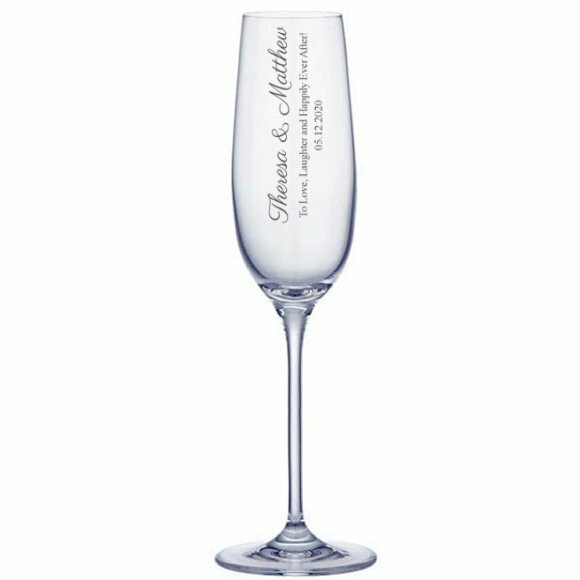 The Vertical Script Toasting Flute is a tall and elegant champagne glass to toast your night away! Personalize with the versatile Vertical Script design with a heartfelt message to be treasured. Celebrate with your bridesmaids, friends and family, VIPS, or choose to purchase 2 to create a pair for the happy couple! I would like to thank SG wedding Favors for expediting my order so fast. I order on wed and the gift came on sat. Just in time for me to give to my best friend for her wedding before my baby pop out on Sunday. Thank you SG wedding favors! I’ll definitely purchase from them again!